Snakes are scary. Even small ones—the way they move, the prospect of venom, those little forked tongues—can send chills down your neck. But did you know that some snakes can eat human beings? A tragic incident in Indonesia recently reminded the world of this fact. A 25-year-old man named Akbar disappeared on Sunday when he was harvesting palm oil on the Indonesian island of Sulawesi. 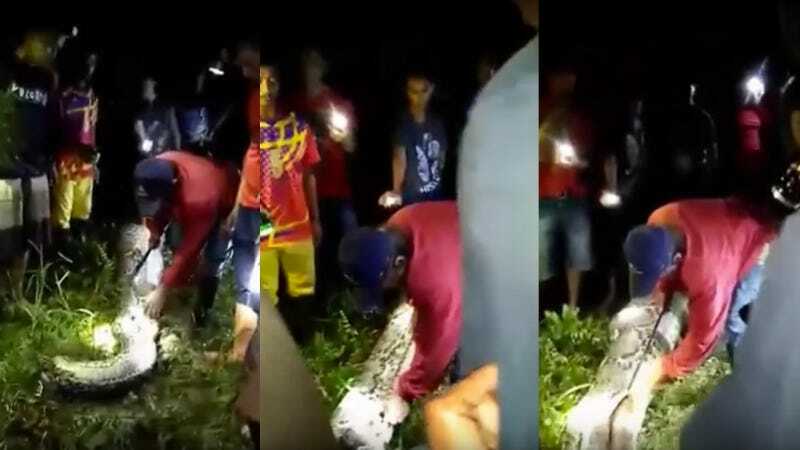 By Monday, his fellow villagers were searching the jungle for the man and, according to local police, the search party found “scattered palm oil fruit, a picking tool, and a boot” near a 23-foot-long reticulated python. The villagers chased down the snake, cut open its gut to their horror (as well as the world’s) they found Akbar’s body inside. So, to recap, an able-bodied man in his 20s was working in the fields and a snake the length of a city bus attacked him. The reticulated python, the world’s longest snake, got ahold of the man with rows of teeth that turn inward toward its stomach and then likely squeezed him to death before swallowing him whole. Still alive, the snake chilled next to its poor victim’s belongings before a group of villagers killed it and sliced open its belly to reveal a corpse covered in digestive fluids. Experts say that it’s extremely rare for pythons to swallow human beings, but as we learned this week, it does happen. Were you planning on sleeping tonight? Sorry, this snake story will haunt your dreams for weeks to come.